EuroSavant » He Was Just the Piano Player! He Was Just the Piano Player! 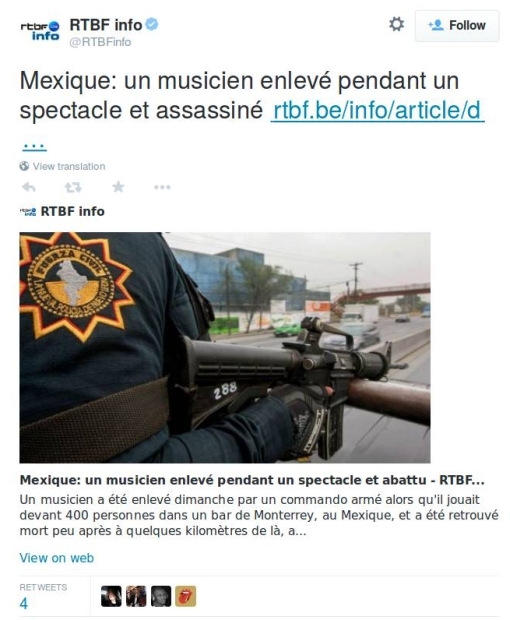 A musician was abducted Sunday by an armed band while he was playing for 400 persons at a bar in Monterrey, in Mexico, and was found dead a while later a few kilometers away, a judicial source announced. The Eternity bar has already been the theater for violent events: on 26 January 2012 eleven members of a musical group were abducted [there] and then assassinated. Some fierce music-critics there! But of course this is no laughing matter, especially not the way that, for this latest incident involving only El Chicken, no one present was willing to tell investigating officers anything more than that there were five in the attacking group and that they were armed. More profoundly, this is merely the latest sign – a bizarre one – that the drug-gang wars there in Northern Mexico are still going on. (The city is only about 150 km away from the Texas border.) Nestled at the foot of the Sierra Madre hills, and said to be Mexico’s most “Americanized” city (FWTW), Monterrey certainly looks interesting, but I would not now advise any tourist-visit there – whether to appreciate the local music, or for any other reason.